China is willing to maintain friendly policies towards Malaysia to deepen cooperation and benefit people of both countries, said visiting Chinese State Councilor and Foreign Minister Wang Yi here on Tuesday when meeting with his Malaysian counterpart Saifuddin Abdullah. As two nations with traditional friendship, both China and Malaysia are developing countries, whose shared interests far outweigh differences, said Wang, adding Sino-Malaysian relations are of "strategic significance." With the establishment of a new Malaysian government, Sino-Malaysian relations now stand at a new starting point. China is ready to enhance high-level exchanges between the two governments and lay out a blueprint for the development of future relations, Wang said. 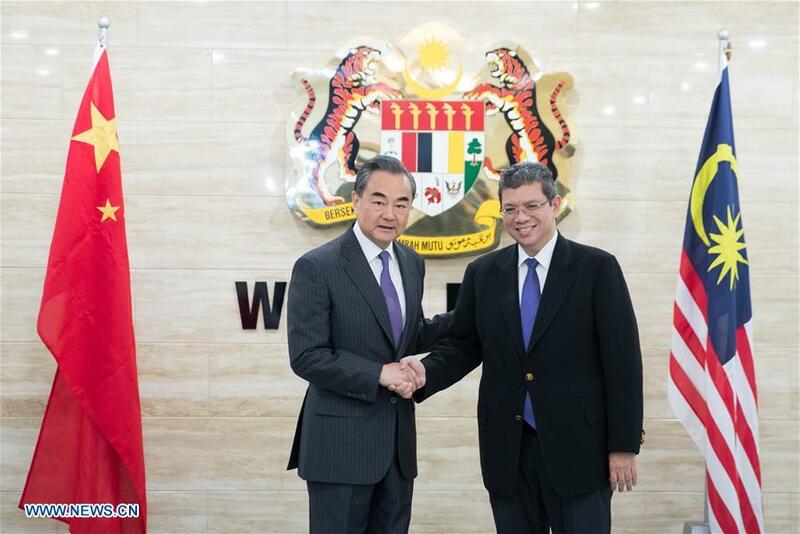 Wang also expressed his appreciation for Malaysia's support of China-proposed Belt and Road Initiative (BRI), saying the joint efforts of China and Malaysia, as natural partners in undertaking the initiative, will open up even greater prospects for cooperation between the two countries and contribute to common development. He noted that the two sides should encourage and support the businesses of both countries in more active cooperation. Wang also highlighted Malaysia's role in regional and global affairs, saying China is ready to work with Malaysia to make sure that the upcoming Foreign Ministers' Meeting of the Association of Southeast Asian Nations (ASEAN) in Singapore will yield concrete results and send a clear message of supporting multilateralism and free trade. For his part, Saifuddin said the two countries have traditional friendship and the bilateral relations have achieved significant developments in recent years, delivering benefits to the people of two countries. Malaysia sees China as a good neighbor and an important partner and the new Malaysian government has attached great significance to the bilateral relations, said Saifuddin. Regarding Malaysian Prime Minister Mahathir Mohamad's upcoming visit to China, Saifuddin said Malaysia looks forward to working closely with the Chinese side to make the visit successful, to enhance friendship and to deepen friendly cooperation in areas including trade, tourism, culture and education so as to bring the bilateral ties to a new high, which is not only beneficial to the two peoples but is also positive for ASEAN, regional cooperation and the world. Saifuddin also reiterated that Malaysia will actively support and participate in the Belt and Road Initiative. China is the closest partner of cooperation for ASEAN, and Malaysia welcomes and hopes that China will continue to play an important role for regional peace and stability as well as common development, he said.